Did you know that you can publish posts to WordPress using email? Learn how to add posts to WordPress via email in this tutorial. Typically, to add new content to your WordPress site, all you need to do is log into your WordPress administration area, create a new post, then type or paste content into your post editor and publish. There are additional ways to post content to your WordPress site, however, that do not require you to open up a browser on your computer or laptop and log into your WordPress admin area. Technology makes posting to your blog via remote methods like email extremely convenient, especially if you have a smartphone. With a smartphone (e.g. iPhone), there are apps you can download for WordPress. 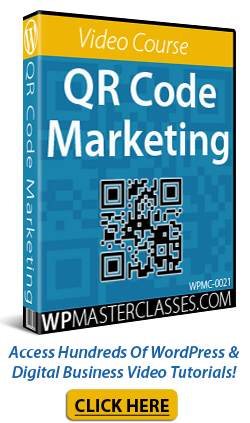 In fact, we have created an entire set of tutorials that show you how to post to WordPress using a mobile device. In this tutorial, you are going to learn how to add posts to your WordPress site using email. First, we’ll cover the manual method for setting up posting via email, then we’ll explain some of the limitations of using the manual method. We’ll also talk about using plugins to overcome these limitations. Once you have completed this tutorial and set up your site for posting via email, you will then be able to go to any computer, or use your smartphone (with or without a WordPress app installed), and simply email your content to a special email address set up specifically for posting content to WordPress. Your post will then be added to your WordPress site without requiring you to first log into your WordPress admin area. Complete the tutorial below to learn how to post to WordPress via email. The first step in setting up your WordPress site so you can post using email is to set up an email address and then connect it to WordPress. Note: You can create an email address with Gmail, cPanel, or anything else, as long as it provides you with “POP3” access. What is POP3? POP3 (Post Office Protocol 3) refers to a communication protocol that is used to retrieve emails from a mail server to the email client’s machine. Just like a post office, POP3 receives and holds your email until you pick it up. When you check your e-mail, your e-mail client (e.g. 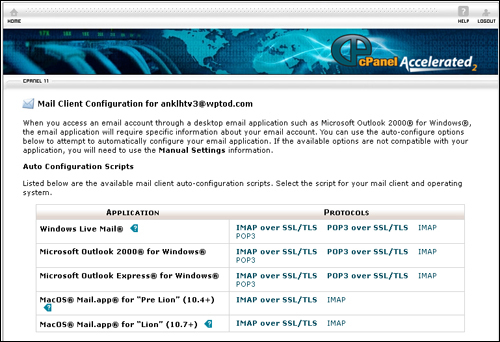 Microsoft Outlook) connects to the POP3 server using your account name and password. Once you’ve logged in, the POP3 server allows you to access all of your e-mail messages. POP3 makes it easy to check your email from any computer in the world, provided you have configured your email program to work properly with the protocol. If your email provider or application doesn’t provide “POP3” access, then choose another email provider. Do not share your email address with anyone. Anyone with access to the email address you created specifically to post content to WordPress will be able to post content to your WordPress site. For this reason, we recommend creating a “secret” email address that is very difficult to guess and that is known only to you. You can use random characters, such as those suggested by WordPress, or create your own. Be aware, however, that some e-mail servers do not allow numbers-only e-mail accounts or accounts starting with a number. Please check with your web host if you have any doubts, or experience any problems. Remember: Any e-mail sent to this address will automatically be posted to your blog, so be careful. 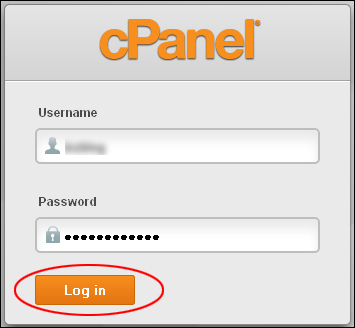 In this example, we’ll use cPanel. Scroll down the page until you see the Manual Settings section. This section contains the information that you’re going to need for the next step. Leave your cPanel browser open or copy the above details down into a text file and go back to WordPress. Mail Server: Enter “mail.yourdomain.com” (use your domain name). In Port, enter the port number as per your settings. Typically this is ‘110’ – if this doesn’t work, you will need to contact your webhosting company to find out which port number you should use. Log in name: This is the new email address you have just created. Password: Enter the password associated with your new email account into this field. Note: the password is displayed in plain text, so make sure that you know which users have access to the Settings > Writing page because they will be able to login to your “secret” email address. 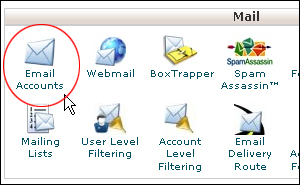 Default Mail Category: Whatever category you select here is where all of your posts sent via email will be posted under. 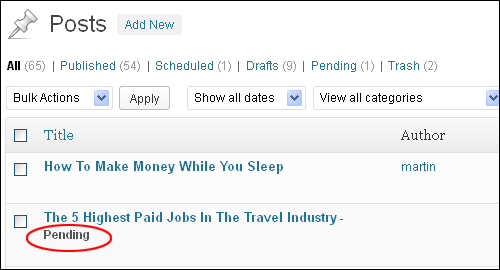 Tip: You can set up a category specifically for posts that you send via email. Every email message you send will create a new post on your site. 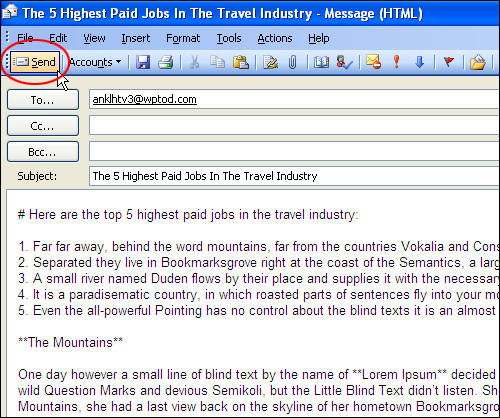 The subject line of your email will be the Post Title and the body of your email will be the content of your post. Only plain text messages are received by WordPress. If your email is not sent in plain text, WordPress will ignore the entire email body content (you will have a post with a title but no content). If you normally use HTML in your emails, remember to switch your email program to “plain text” before sending out your email. Do not attach files when sending emails. If you do, WordPress will most likely ignore the email body. If “Re:” or “Fwd:” are present in the subject line of your email, these will be added to your Post title. If the email message is sent from an email address that matches a user account with posting permissions on your site, the email will be Published with that account as the author. If the email message comes from an email address that does not match an existing account or an existing account with posting permissions on your site, the post will be saved with a “Pending”status, not “Published”. Mail Server: Enter “ssl://pop.gmail.com“. In Port, enter ‘995’. 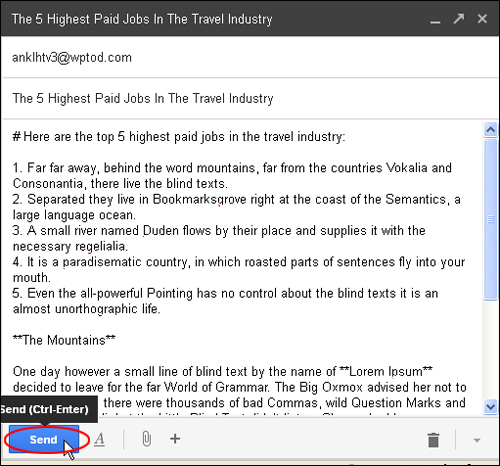 When you send emails directly from your Gmail account, select “Plain Text” before sending, or the body of your post will not appear in your post’s content area. Once you have completed the above, the next step is to send a test email to your new address. 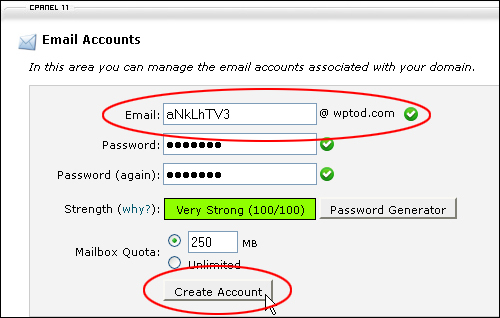 Enter the email address you have created specifically for posting content to WordPress. The subject line is the “Title” of your post. When creating the body of your post, begin by adding a “#” symbol. Type in your content. You can add ordered lists if you want to. Note: Using this method to post content to WordPress has certain limitations. You can only use standard characters and plain text. In the following section, we’ll show you how to get more out of the “post via email” feature of WordPress using plugins. To ensure that you post is added to WordPress, you will need to type in a specific URL into your internet browser after sending your email that will then trigger a WordPress command to import your post from your POP3 email account. Now that you know how to post to your WordPress site via email, then next step is to automate the process of triggering the wp-mail.php URL. To do this, you are going to need to set up an action called a Cron Job on your server that will automatically trigger the URL every hour of every day to ensure that any posts sent to your site via email get added to your site. The next step after setting up your WordPress site to post using email is to set up a Cron Job so you can automate the process. 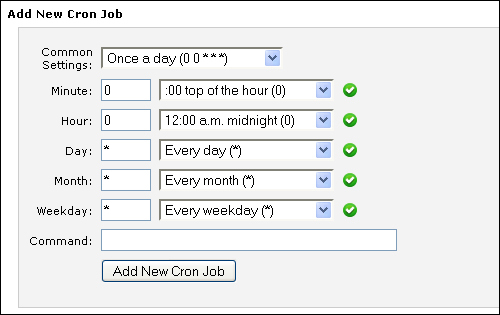 A Cron Job is a time-based job scheduler that resides on your server. Cron jobs allow you to automate certain commands or scripts on your site. You can set a command or script to run at a specific time (e.g. every 5 minutes, every hour, twice a day, once a week, etc…). Note: The time period you select for running your Cron Job depends on how frequently you plan to post to your WordPress site via email. Although you can set up a Cron Job to run every minute of every hour of every day, we suggest not doing this for this particular job, because every time you run a Cron Job, it uses up server resources. The best way to calculate the time interval for your Cron Job is to be realistic about how often you intend to post content to your WordPress site via email, and how urgently the content needs to be added to your site. Do you plan to post every few hours? Every day? Every week? Twice a week? 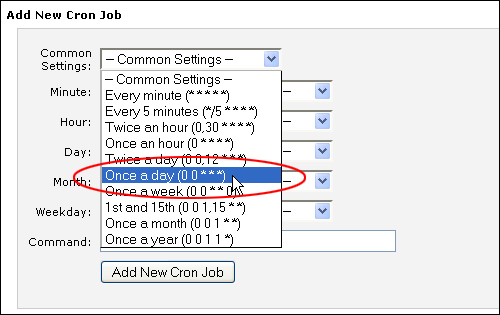 If for example, you plan to post once or twice a week via email, then you should set up a Cron Job to run either every day or once a week (you can edit the Cron Job time interval anytime). 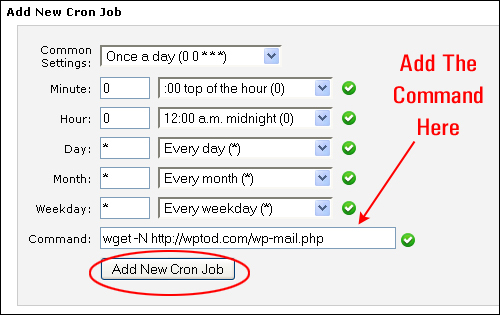 Now, the Cron Job is going to run every day, and every time you send an email to your WordPress blog or site via the specific email address you have created in this tutorial, your post will be automatically added to your WordPress site. 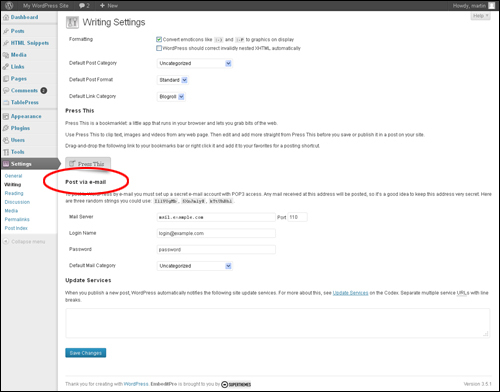 You no longer have to manually activate the link containing the wp-mail.php file. Note: If you experience any issues with the Cron Job (e.g. not posting), contact your webhosting provider – they will be able to advise you on how to fix the issue, or let you know if an alternative command is required to make the Cron Job work on your server. As you can see, posting to WordPress manually via email has some limitations. Having to open up an internet browser to trigger a command to post your content to WordPress after creating and sending an email seems to defeat the purpose of using email to avoid opening a browser to post content. Not only that, but you are then limited to posting simple content in plain text only and having to create a cron job on your server to run the task. Fortunately, you can use a plugin like Postie to help make sending posts to your WordPress site via email a lot easier. Postie allows you to create posts via email and includes many advanced features not found in WordPress’s default Post by Email feature, such as the ability to assign categories by name, include pictures and videos, and automatically strip off signatures. It also supports IMAP and POP3, with the option for SSL with both. Congratulations! 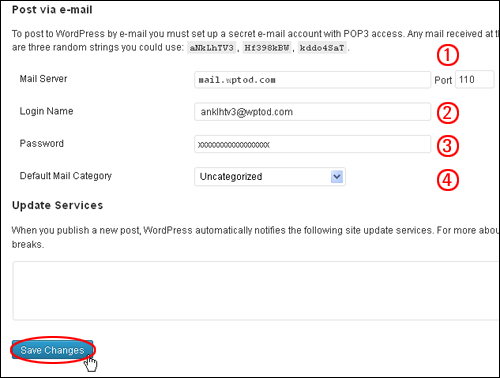 Now you know how to add posts to WordPress using email. 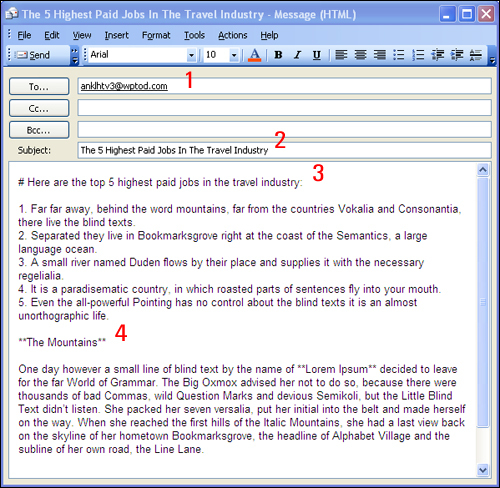 Originally published as How To Add Posts To WordPress Via Email.